A recent study confirmed that beetroot-carrot juice is effective in treating chronic lymphocytic leukemia. It’s amazing how we often overlook simple but effective solutions to our problems while looking for fancy, demanding, expensive, and time-consuming approaches instead. It almost seems like we have this hidden belief that if something is simple, most likely it doesn’t work! This is often seen with medical issues as well, including cancer treatment, and people really don’t know what they’re missing out this way. Chronic Lymphocytic Leukemia (CLL) is considered to be a relatively benign type of cancer because statistical studies indicate that in the United States, 82.4% of people diagnosed with CLL survive at least 5 years, and 64.7% survive ten years. CLL is a relatively benign type of cancer that affects the body’s bone marrow—specifically, the lymphocytes (white blood cells) it makes. During CLL, the body starts mass-producing B-cell lymphocytes, which are immune cells that make antibodies to fight any kind of threats that may enter the body. So what? More lymphocytes and more antibodies mean better immunity, right? What happens in the body during chronic lymphocytic leukemia? So, everything starts with the body producing hordes of B-lymphocytes, a type of immune cells. Contrary to how it may sound, this doesn’t improve immunity. When the body makes too much of one blood cell type (B-lymphocytes in the case of CLL), it makes less of other blood cell populations. Basically, these cancerous B-cells “crowd out” other blood cells. The “mass-produced” B-lymphocytes generally don’t work very well, so immunity actually decreases. When too many B-lymphocytes are made, at one point or another they will start making aberrant antibodies that target the body’s own tissues and lead to autoimmune diseases. A low platelet count leads to bleeding. Being low in red blood cells leads to fatigue, shortness of breath, headache, lethargy. Being low in healthy immune cells leads to frequent and persistent infections. Antibodies to the body’s own tissues cause autoimmune diseases (autoimmune hemolytic anemia and thrombocytopenia being some of the most common). Night sweats and fever are a common result of the huge amount of antibodies (produced by the tumorous B-lymphocytes) and by the body being easily susceptible to infections due to poor immunity. With proper support, people may live for decades with CLL—but their quality of life can be severely decreased due to the various symptoms mentioned above. Imagine living for 10-15 years with bleeding, fatigue, night sweats, and shortness of breath. As if that wasn’t enough of a torture, conventional chemotherapy comes with its own usual side effects, like vomiting or nausea. Fortunately, Nature seems to have its own weapon against CLL, and studies have recently confirmed how effective it is! 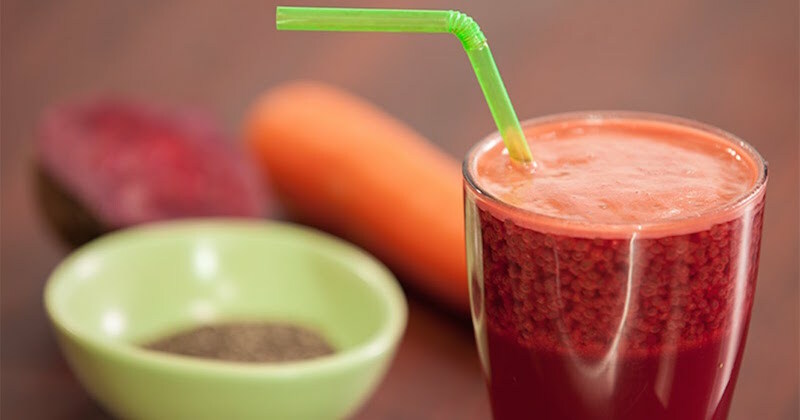 A few years ago, a Macedonian study reported that beetroot-carrot juice is an effective treatment for CLL—both alone, and when combined with other healing approaches. Such an approach resulted in an amazing improvement both in lab results and in subjective symptoms! A few days after starting the juice therapy, fatigue decreased and performance in daily activities improved. Appetite improved as well! In this test, it was evident that beetroot-carrot juice had quickly resulted in a drastic improvement in general health and blood cells, which is fabulous! The best part? It didn’t lead to any side effects whatsoever, contrary to what’s usually seen during conventional CLL treatment. Seems like beetroots and carrots are really great for this condition! And by the way, the anti-cancer potential of these two vegetables doesn’t stop at just CLL. Betanin, the red pigment of beetroot, can fight some types of breast cancer by activating the self-destruction of cancerous cells while at the same time protecting the heart from the toxicity of conventional drugs. Betanin is also mildly effective against prostate and pancreatic cancer cells. Betanin can help prevent skin and liver cancer, according to animal studies. Beetroot effectively activates antioxidating and detoxifying enzymes in the liver, extremely important processes during any kind of cancer or chronic inflammation. For a food component to be considered beneficial for health, it must be bioavailable following ingestion, in order to be utilized by cells. In this study, it was evidenced that beetroot is a bioavailable source of bioactive compounds in humans. In many human disease states, such as cancer, oxidative stress is a chronic disorder that induce long-term cellular disruption. Beetroot is an exceptionally rich source of antioxidant compounds. The betalain pigments in particular, has been shown in studies to protect cellular components from oxidative injury. However, betalains are not the only antioxidant compounds found in beetroot. Several other highly bioactive phenolics, such as rutin, epicatechin and caffeic acid found in beetroot are also known to be excellent antioxidants. Nitrite, found in beetroot have been shown to suppress radical formation and directly scavenge potentially damaging oxidants. Collectively, the many studies conducted to date, provide evidence that beetroot is an excellent source of antioxidants that protects cellular components from oxidation. This would suggest that beetroot supplementation might be promising in helping to manage diseased states propagated by oxidative stress, such as liver injury and cancer. So while the active components in beetroot show promising results in fighting active cancer, carrots are fabulous in preventing cancer development. For instance, studies indicate that eating more carrot decreases the risk of urothelial cancer (cancer of the inner lining of urinary organs, such as the bladder and urethra), breast cancer, gastric cancer, prostate cancer, and lung cancer in smokers (but no effect in ex-smokers and never-smokers). Most likely, carrots do this through a powerful blend of antioxidants that prevent oxidative damage to the cells, particularly the DNA (studies on smokers confirm this thought). In 2013, Ann Cameron cured her Stage 4 colon cancer without conventional treatment, but by drinking only organic carrot juice. Her prognosis was two to three years, and not much more with chemo. Distraught, she read everything she could find on the internet about alternatives to chemotherapy and radiation, and came across Ralph Cole’s story. Cole had cured his neck cancer with carrot juice. He initially drank juice from 3 lbs of carrots that yielded 3 glasses, but didn’t get satisfying results. When he increased his carrot juice intake to 5 lbs of carrots daily (yielded 5 glasses), he began to see his tumors shrunk almost immediately. As Cameron was in generally good health when diagnosed, she put off chemotherapy and radiation, to see if carrot juice would halt the growth of cancer. She began drinking juice from 5 lbs of carrot daily, without any diet modifications. 8 weeks after her carrot juice therapy, tests showed that her cancer growth had ceased completely and the tumors had shrunk, with reduction in the number of swollen nodes. Two weeks after starting the carrots, there was no improvement. Eight weeks after starting the carrots, the tumors had stopped growing and were shrinking. Four months after starting the carrots, all the lymph nodes in her lungs had returned to normal. Eight months after starting the carrots, there was no sign of cancer anywhere in her body. According to Ann, the important compound that affect induced-cancer in lab rats in experiments, was a polyactylene, falcarinol—which is not an antioxidant. This compound is found in the highest concentration in carrot peel, and has been reported to reduce tumors successfully. She went on to write a book that describes the details of her carrot treatment, providing scientific evidence for the miraculous health benefits of carrot. Since then, others with a variety of cancers have reported similar successes. Her ground-breaking book describes the details of the carrot treatment and the scientific evidence for its power, and the study of how chemical switching mechanisms in our bodies change the expression of our genes. The scientific information in this book could be a life-saver for someone you know. Also read about the 82-year old man who cured his heart and kidney problems with carrot juice. As you most likely recognize by now, there is significant healing power in natural whole foods. Beetroot and carrots are only two of the most healing of them. When consumed together, they provide a synergistic healing power that is almost magical. The use of beetroot and carrot juice, and a few other vegetables in the Breuss Cancer Diet proved that it was successfully used in tens of thousands of cancer cases. Although everything above sounds fabulous and all, remember that eating or juicing carrots and beets is just one part of the health puzzle. Avoid added sugars, food additives, dyes, and other artificial substances. While drinking juices, cleansing your body of toxins can help speed up your healing. Learn more about the correct order to detoxify your body.